Why New Bath? We are dedicated to bringing homeowners in Columbus, Cincinnati, Cleveland, Toledo, Dayton, and all throughout the state of Ohio bathing independence. 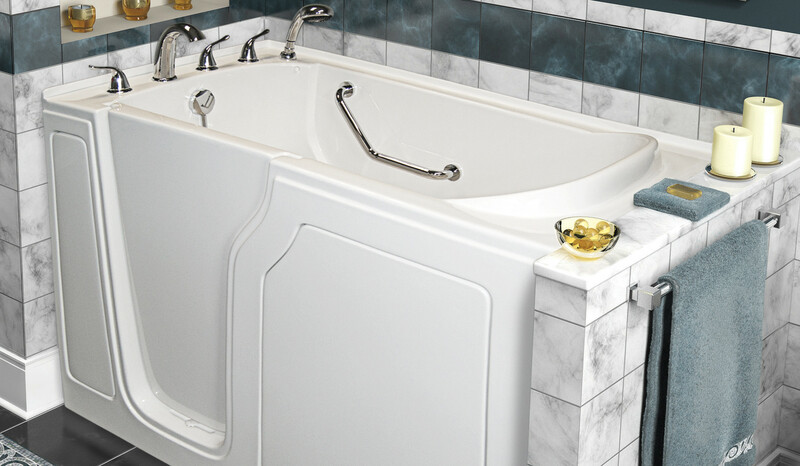 Our walk-in bathtubs are high quality, safe and beautiful. We have a variety of walk-in bath options to fit your needs. We are the local dealer of the Jacuzzi Step-In Tub. A walk-in tub from New Bath is not only safe, but easy to clean and comes with features like hydrotherapy and safety grab bars. Here at New Bath, our professional installers are what make the difference. They are glad to walk you through all of our walk-in bath options and answer any questions before, during and after your walk-in bathtub installation. Many of our affordable walk-in tubs can be installed in as little as one day! Columbus, Cleveland, Cincinnati, Dayton, and Toledo homeowners, contact us today to request a free, no-obligation design consultation and see how we can help you gain bathing independence safely and with style. As seen in magazines and on television, the New Bath Walk-In Tub is an amazing therapeutic massage system that adds comfort and independence to any home. For more information, please call 1-800-620-1882 or click below to receive a free information packet on our walk-in tubs and our safety options. Schedule your FREE, no obligation in-home consultation today. Contact us to have our Safety Representative visit your home today and help you find the ideal Walk-In Tub for your lifestyle and needs. Schedule your FREE in-home consultation today!